The handlebar controls is not the most difficult, but probably the most enjoyable work within the project. We have already assembled the fork, yokes, adjustable clip-ons and motogadget digital consoles, so it was time to assemble all the controls and connect the cables. Footpegs are also adjustable, which allows you to accurately adjust the riding position and handlebar. When assemblying the handlebar control, we tried to keep the factory clutch and throttle cables so that they could be easily replaced if necessary. Everything else was done from scratch. Air choke cable was removed, because the engine was bare, which allowed us to easily open the air choke manually on the engine. The original throttle cable has a plastic tip on the braiding, which can be easily adjusted to any throttle machine. We chose the minimalistic Biltwell handle, which is suitable for 120 mm long grips. Clutch cable on BMW K1100LT has a non-standard tip. To install this cable on the ABM clutch, we had to make an adapter and bushing. As a result, it turned out elegant and functional, plus we managed to save the factory cable. We decided not to do the clutch sensor, because there is a neutral indicator, so the start of the starter on the transmission is not likely to happen. We chose soft LSL Clubman grips with good traction that are 120 mm long. Grips are made to fit a 22 meter diameter tube, but their outer diameter is the same as the inch ones have. On our motorcycle such grips look massive and it feels nice to hold them. ABM Short Caps weights fit best - they are compact and gently close the ends of the tubes. The choice of mirrors turned out to be the most difficult, especially since not everyone in our team uses them, so the appearance was just as important as the functionality. We stopped at the ones with legs - such mirrors seemed the most appropriate. There are special clamps with mirrors holder made by ABM, so mounting them was not a problem. 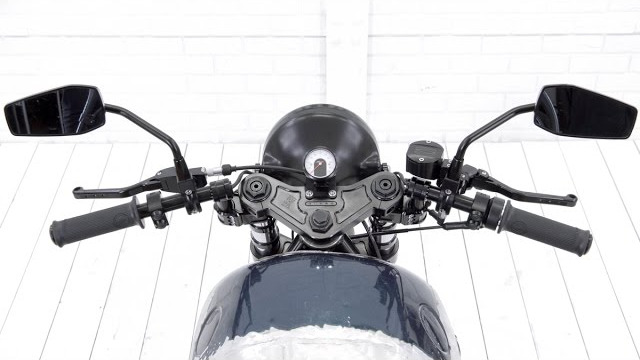 In general, the handlebar control turned out well, it looks good and is practical thanks to adjustable clip-ons! You can purchase all the spare parts and get some advice in our store!